Dr. Pryhuber trained in Cincinnati, Ohio and in addition to her research work, serves as an attending neonatologist at URMC In collaboration with other members of the neonatal team. She passionately enjoys providing thoughtful, detailed, cutting-edge medical care to at-risk or critically ill newborns and their families. She embraces the team-approach to medicine involving nurses, mid-level providers, social workers and care coordinators, as well as the family in decision making as much as possible. Dr. Pryhuber's particular clinical interests are care of infants with pulmonary hypertension, lung injury, growth and developmental failure, often complicated by chronic and inflammatory disease. She leads the neonatal pulmonary hypertension consultation team. Dr. Pryhuber trained as a post-doctoral Proctor Research Scholar and participant in the University of Cincinnati Program of Excellence in Molecular Biology of the Heart and Lung. She has since accumulated > 20 years as independent researcher and author in lung injury and immunology. 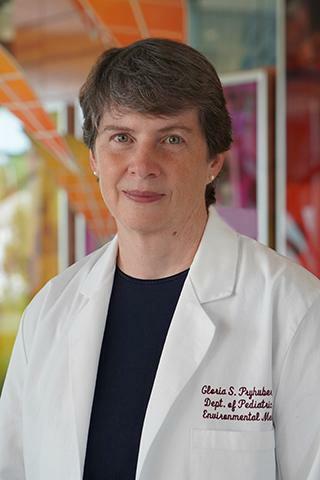 She serves on NIH study sections and as reviewer for journals in her area of expertise, manages an active laboratory, supervises students in pulmonary biology and epithelial cell research and has received awards recognizing both teaching and original research accomplishments. She teaches regularly for the UofR Toxicology graduate program, Medical School and Pediatric Residency. An NIH-funded physician-scientist with expertise in human perinatal lung injury and repair, Dr. Pryhuber also served nine years as Perinatal-Neonatal Fellowship Associate Director and mentors undergraduate, graduate and post-doctural students. She is honored to be a member of the American Pediatric Society, the Perinatal Research Society, and the Society for Pediatric Research, the American Thoracic Society, the American Academy of Pediatrics, the International Cytokine Society and the American Physiological Society. As Professor in the Departments of Pediatrics and Environmental Medicine, Dr. Pryhuber also acts as communicating PI for the UofR / University at Buffalo Center for the Prematurity and Respiratory Outcomes Program (PROP, NHLBI U01), as Lead Site Investigator for the UR-Respiratory Pathogens Research Center Clinical Study I (NIAID / DMID Contract), PI for the Lung Molecular Atlas Program Human Tissue Core (NHLBI U01) and remains active as clinical academic Neonatologist and Pulmonary Hypertension Team member. Dr. Pryhuber directs the UofR Pediatric and Environmental Health Sciences Center Histology Facility since 2009 and Pediatric Processing Lab since 2011, providing, through the work of talented technicians and University resources, technical support and training for preparation and analysis of tissues and cells of organisms ranging from human to drosophila. Dr. Pryhuber has also provided access to an archive of neonatal lung tissue acquired by expedited autopsy at gestational ages varying from 24 to 43 weeks. In collaboration with investigators in multiple centers, subsets of the archive are published, contributing novel observations pertaining to vascular development, epithelial cell abnormalities and inflammation in bronchopulmonary dysplasia. This repository is expanded by the LungMAP to collect donated human lung across the developmental spectrum from pseudoglandular through alveologenesis. These successful clinical and research programs demonstrate particular interests and strengths in creating multi-disciplinary teams of investigators, coordinators, nurses, technicians, and information specialists. They create and foster active collaborations of investigators and clinicians in neonatology, pulmonology, infectious disease, obstetrics/perinatology, immunology, microbiology, pathology, toxicology and genomics, as well as extramural collaborations around perinatal development and disease. Clinically, preterm infant cohorts are enrolled in longitudinal studies. In the laboratory, fresh isolated cells, cell lines and whole animal models are utilized to understand cellular interactions during development and inflammation. Specific studies determined parenchymal TNF receptor signaling mechanisms that regulate gene expression, inflammation and apoptosis in the lung. More recently, high-dimensional flow cytometry, cell sorting, transcriptomic and genomic techniques are applied to understand the effects of in utero environment, premature birth and microbial colonization on the adaptive immune system and lung. The impact on respiratory morbidity and mortality of alterations in CD4 and CD8 lymphocyte responses to stimuli are the focus of active studies. Ali M, Heyob K, Tipple TE, Pryhuber GS, Rogers LK. "Alterations in VASP phosphorylation and profilin1 and cofilin1 expression in hyperoxic lung injury and BPD." Respiratory research.. 2018 Nov 21; 19(1):229. Epub 2018 Nov 21. Pryhuber GS. "Renewed Promise of Nonionizing Radiation Imaging for Chronic Lung Disease in Preterm Infants." American journal of respiratory and critical care medicine.. 2018 Nov 15; 198(10):1248-1249. Book Title: Neonatology: Pathophysiology and Management of the Newborn. Author List: Whitsett JA, Rice WR, Pryhuber GS and Wert SE. Edited By: Mhairi G. MacDonald, MD Mullett and MMK Seshia. Chapter Title: Postnatal Infections and Immunology Affecting Chronic Lung Disease of Prematurity. Book Title: Bronchopulmonary Dysplasia: An Update. Author List: Kallapur, S.G. and Pryhuber, G.S., Ed.